What Happened: I'm not a professional athlete and I will never be one, so I don't know the mindset of a pro baseball player. That said, the way that the Cubs have operated so far this season and the way they played this weekend leads me to believe that with a series against the St. Louis Cardinals coming up next week, the Cubs might have looked past the Rockies. The past two games, the Cubs haven't had a whole lot going on offense, despite the 6 runs they hung on Colorado on Saturday. 5 of the Cubs 6 runs came via the long ball. 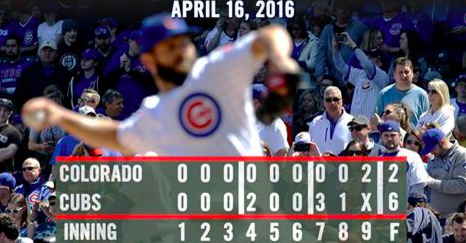 Today's game was not great and the biggest reason I think the Cubs were looking past the Rockies to the Cardinals. Despite leading the league in walks so far this season, the Cubs walked a whopping ONE time today. That's not a recipe for success. Part of the problem was that the strike zone was quite large today, but the Cubs didn't do themselves a lot of favors, chasing a bunch of pitches out of the zone. Tyler Chatwood is never going to be confused for a pitcher with dominant stuff, with a career K/9 of 5.23. 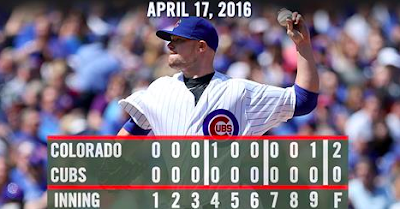 And yet because of the wide zone and the Cubs pressing, he was able to strike out 7 over 7 shutout innings. Barf. These kinds of stinkers are gonna happen sometimes, so no reason to panic yet. Obviously losing a series to the Rockies isn't how you want to go into a big series with the Cardinals in St. Louis, but it is just the first Cubs series loss of the season, which is awesome. And they wrapped up their homestand at 4-2. That's good. MVP: The starting pitching. Over the last 2 games, Arrieta and Lester have combined for 15.1 innings, 12 total baserunners and 18 strikeouts while yielding one single earned run. After 3 starts, Lester has a 2.21 ERA and Arrieta has a 1.23 ERA. Baller. That's...not ideal. Now they do make up for it with high OBP potential, but as the Mets showed the Cubs in the playoffs last year, there's going to be some times where home runs and walks alone won't get it done and base hits are necessary. Again, it's early, but the Cubs bating average is currently 15th in the league. Ooooh baby do we have a big one coming up. The Cubs face their first real test of the season against the suddenly pretty hot on offense Cardinals for three games starting tomorrow night. A lot of attention will be paid to the return of Jason Heyward, but John Lackey is also making his return as well. He'll be pitching for the Cubs and opposed by human garden hose Mike Leake. How are there this many Chong Li gifs? Some things are better left unanswered.